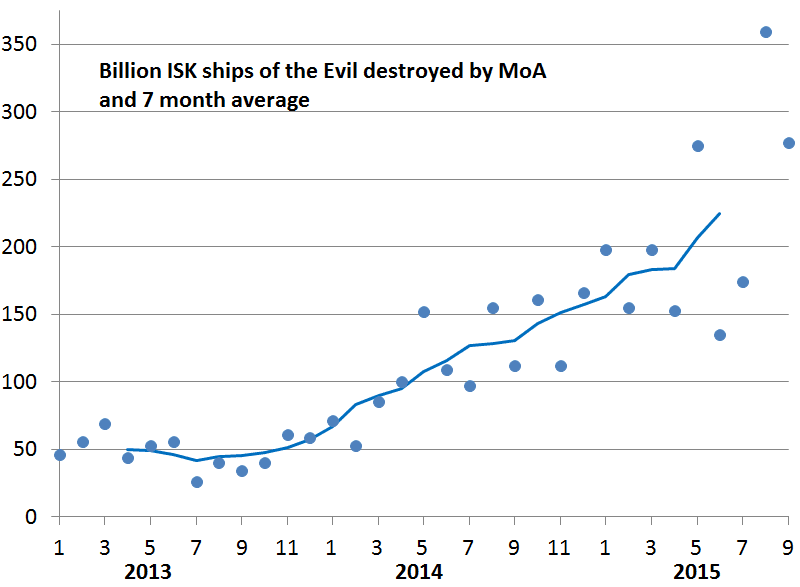 At first, the obligatory chart about MoA monthly Imperium kills. Isn't this chart an investor's dream?! Be part of this miracle! Donate and watch the minions of Evil burn! If this chart goes high enough, their line ratters will seek other region to live in. This is the summary of corps against the Imperium. Please note that Raging Angels joined mid-month, and Raging Ducks, their ancestor had 22B damage this month. I'm surprised goons do kick corps like raging. It seems a common theme in eve that ex's will turn bitter. Surely better to let them stay under the roof benignly than have them turn on you when kicked outside. @anom0359: unless you need more enemies for the enterteinment of your linemembers. Gevlon, why don't you donate top 10 MOA pilots? It would be nice - 1-2bil each. Why top MoA pilots then, not top 10 pilots of all EVE? The answer is that I'm not sure that they can achieve this without the support of "lesser" pilots (scouts, JF haulers). If the support pilots die out, the top performers can stop performing. Of course there is a reason why a "top 100 pilots" is listed on the monthly CFC losses post. It's the backup plan if MoA would for whatever reason fail. Currently I don't see that happening, but having a backup plan is always great. So an increase in AFK ratters to kill for MOA = success in destroying the Imperium? I'd expect success to mean LESS ratters are killed as they either stop logging in or at least start paying attention to local intel. More killed = stronger. Interesting. At what point on the graph did you start investing in MOA? (I'm a different anon). Things don't exist in a vacuum. It's entirely possible that the imperium has gotten stronger in spite of your efforts. It's worth considering, at least, that after all this time if MoA was having a meaningful impact then it would be reflected in line member behavior by now. You have been going full-bore at these guys for the past year and it seems that they are ratting in, largely, the same places. 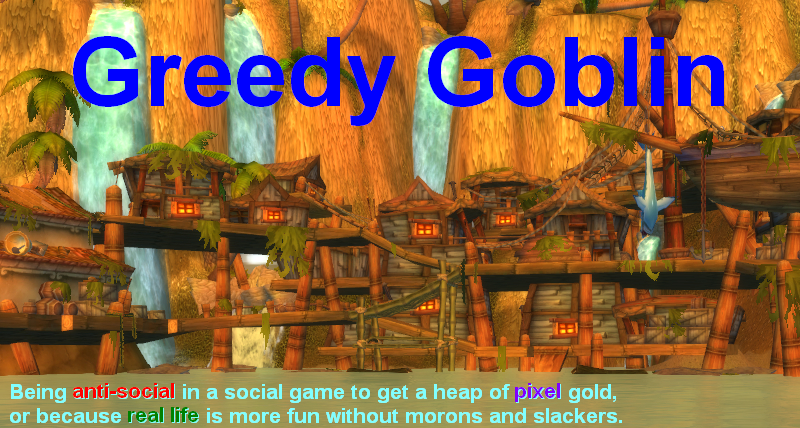 Even "morons and slackers" don't run straight to their deaths while trying to kill NPCs for a year straight. Because of this there are two answers that become obvious. 1: The MoA campaign has been largely ineffective, failing to kill ratters often enough to produce a desirable result. 2: The Imperium has not remained stagnant and has become stronger, rendering the MoA campaign ineffective. Even morons and slackers get better at what they do. It's entirely possible that the line members of the imperium have gotten better at making Isi and that ratting is no longer their only source of income. Additionally, a numbe of people have stated that they get reimbursed for ratting losses under the right circumstances. If true, this practice would be unlikely to stop, due to the impact that ratting has with Fozziesov. Gevlon, I say this next part as someone who isn't particularly fond of the imperium. If you don't want to be posting Imperium ratting losses in October of 2016 then you need to get a more effective method of hurting your opponents. The current method hasn't seen results the way anyone would like. The imperium hasn't dropped any regions hasn't collapsed hasn't split into smaller groups hasn't seen a massive or even meaningful loss of members or even anything more significant than a station camp as a response from the imperium. Those "hellcamps" are the only response that your enemy has really put up. Please I implore you think about that for a minute. You have spent over a year and untold billions of isk and have very little to show for it. As good as MoA is, even the casuals aren't inconvenienced enough to make meaningful changes to where they go AFK to shoot NPCs. On its own that really should tell you something. Again I really do respect the concerted effort that has been made to destroy the Imperium. I just ask that you really take a good look at how limited the impact you have made is and consider a better strategy. The fact that you post here on this blog that MoA consistently kills people in the same areas in increasing numbers shows that you have yet to make an impact that will make your enemy care. And when you do hit that point, what then? You will have spent billions upon billions to make ratters change their habits slightly. Do you know what happens when a ratter isn't AFK sees a hostile fleet enter system? He rocks up, reports on the Intel channel and a defense fleet swats the problem away, provided the invaders are there long enough to warrant a response. The Imperium wins here. If we're being honest, the Imperium has you outgunned by a long shot. MoA just isn't currently capable of fighting off a halfway decent defense fleet in the Imperium's heartland. By now I'm sure you are writing a response, and I'm sure you have thought of what happens at this point when you actually have some measure of success. Please realize one thing. Before you can ever become more than a pest, MoA will need to get a lot better. The Imperium has you vastly outnumbered, out funded and out equipped. (Supercap fleet anyone?). Look, all I'm saying is that you will need to convince MoA to adapt in order to inflict any real, meaningful, and lasting damage. I started to support them in 2014 June. @Last anon: Your whole page of "you did nothing" indicate serious butthurt. Was it a carrier? I'm in TEST, so no.